Speaking to constituents in Queens, Alexandria Ocasio-Cortez urged public school parents to think big on education — and to fight attempts to divide working class constituencies. Alexandria Ocasio-Cortez speaking to reporters in Washington, February 7, 2019. Senate Democrats / Wikimedia. People began lining up in front of the Fiesta Hall in Jackson Heights, Queens, at least an hour early, some with their kids. Many had their phones out; there was a lot of live-Instagramming going on. Inside, it was standing-room only. As passionately as parents feel about education, discussions of school policy rarely get such buzz. But last Saturday’s Education Town Hall, organized by Jackson Heights People for Public Schools, was special. In addition to panelists from Class Size Matters, NYC Opt Out, Network for Public Education, New York State Alliance for Bilingual Education, the Alliance for Quality Education (AQE), and New York State Allies for Public Education (NYSAPE) — as well as newly-elected State Senators (and longtime education activists) John Liu, Jessica Ramos and Robert Jackson — we were expecting to hear from Congresswoman Alexandria Ocasio-Cortez. Of course, everyone wanted to see the charismatic AOC in person and take a selfie with her, and why not? (We, too, were pretty excited to be seated only two rows away.) But more importantly, it wasn’t immediately clear what she would say in such a setting. Given statewide public-school parent organizing — for funding equity, and against high-stakes testing and school privatization — and a climate in which progressives have been building electoral power, opponents of neoliberal education policy have reason for optimism in New York state. But thanks to the longstanding bipartisan consensus in favor of hedge-fund driven education remedies like charter schools and testing, even the most progressive national politicians have been complicit with pernicious “teacher accountability” schemes. Senators Bernie Sanders and Elizabeth Warren both pushed to keep the annual standardized-testing mandate — beloved of education-reform types as a cudgel to use against “low-performing” public schools and teachers, as well as a reliable profit stream for the test-prep industry — in the 2015 renewal of ESSA (Every Student Succeeds Act, the latest rebranding of No Child Left Behind). Spoiler: She did not, at least not on Saturday. Instead, she came out firmly against the privatization agenda, and urged parents to organize to have the testing mandate removed from federal education policy. But more than that, she exhorted us to reject the menu of bad options and divisive fights served up by austerity conditions, and instead embrace “a solution on the scale of the problem” as well as the solidarity that such an approach requires. 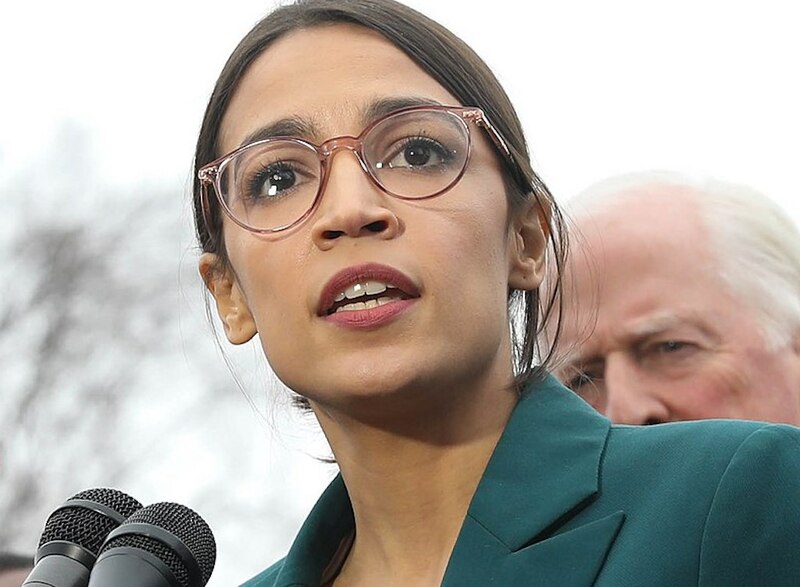 AOC described how Betsy DeVos and her band of privatization zealots in the the federal Education Department were actively deregulating education in the interests of charter school profiteers on Wall Street. “What we need to do is realize the scale of the problem and organize our hearts out. Because it is not going to come from just one vote,” she explained, “and it’s not just going to come from the Congresswoman in New York’s Fourteenth district. This needs to be a national movement. Where we realize our agency. And the good news is that it has already started.” She connected the organizing reflected in the room to the ongoing wave of teachers’ strikes, most recently in West Virginia, Los Angeles and Oakland, in which opposition to austerity and privatization has taken center stage. “We are seeing it all over the country,” she emphasized. At times, the Town Hall was like a rally, full of inspiring calls to action. The audience cheered when panelists urged the state to honor its commitments to funding equity and to expand bilingual education. AQE’s Maria Bautista called upon elected officials to “cripple the white supremacy curriculum that we have in our schools,” specifically by supporting legislation to mandate culturally responsive education and end racially discriminatory discipline practices. And when Leonie Haimson of Class Size Matters pointed out that a Senate bill to fund smaller class sizes in high-poverty schools was in need of a House co-sponsor, AOC called out, “Good to know!” to satisfied laughter from the crowd. But during the Q&A, tensions emerged. The moderator, summarizing a number of written questions submitted by index card, relayed one from a student at one of New York City’s selective specialized high schools, concerned that it was dominated by “privileged, tutored” students and in no way representative of the neighborhood. But another question characterized admissions test for such schools as an “objective” and “ethnically blind” way to “level the playing field” for applicants. Until this point, the panelists hadn’t discussed the specialized high schools, New York City’s renowned public exam schools, which have in recent years come under justified attack for enrolling few black or Latino students. (Two days after the town hall, public schoolchildren around the city learned which high schools they had gotten into: only seven black kids were among the nearly 900 who got into Stuyvesant, the most selective of the specialized high schools.) Various approaches to reform have been floated, but Mayor de Blasio’s proposal to eliminate the entrance test has been particularly unpopular among Asian-Americans in Queens, where many feel that such a scheme discriminates against Asian students. As this last question was read, and as State Senator Jessica Ramos responded, about a dozen Asian parents, holding signs protesting de Blasio’s plan as “progressive racism” against Asian children, stood to shout down the speakers. Some education activists were dismayed that AOC didn’t take a position on the specialized high school exam. But in a way, her point on that issue — that the division among parents was distracting us from advocating for good schools for all of our children — was more trenchant than any specific solution she could have supported. Independence from such interests, Ocasio-Cortez ventured, could reshape education politics. “Because those members don’t have to respond to corporate PACs they are much more responsive to the public on these issues.” She also pointed out that a number of public school teachers had been elected to Congress during the midterms.